In our house, parents give good gifts but grandparents give amazing gifts. The other day a friend of mine posted a link to a blog that had the most amazing playroom ever. It featured a plethora of “grandparent” gifts and got me thinking about how the items probably had a “parent” equivalent at a more accessible price. I am in love with this idea & plan to implement it as a surprise for my soon-to-be 3 year old’s birthday- she is going to LOVE having a swing in the house this winter. The “grandparent” one is a HABA brand boat called the Ship’s See-Saw Swing and runs for between $275-325 depending on the store. 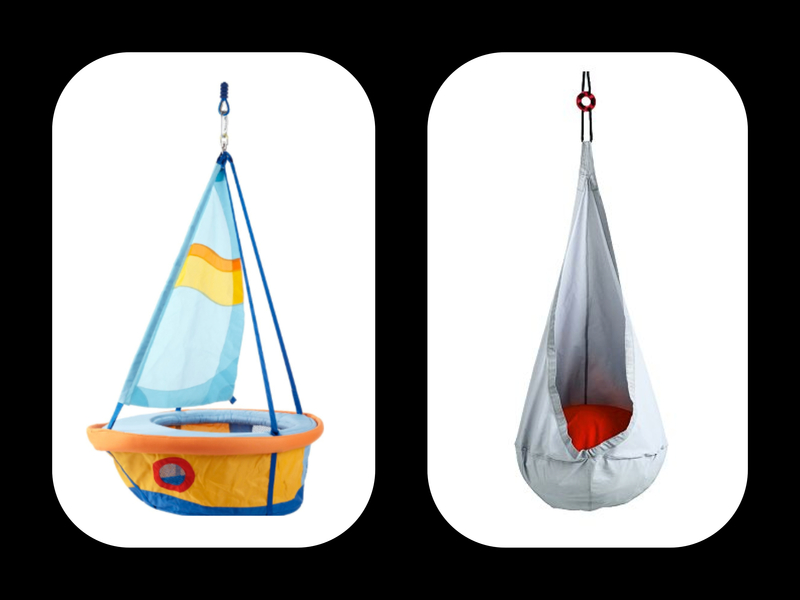 The “parent” version is the EKORRE hanging swing from IKEA and is $45. 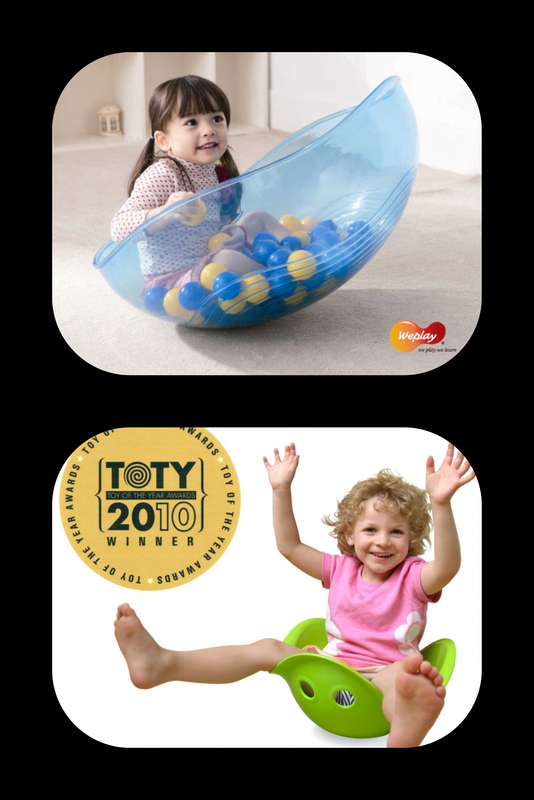 We were at a Children’s Museum the other day and played with this amazing Rocking Bowl by WePlay (WeeBlossom)- it was so much fun that I immediately started to ponder which grandparent to start campaigning to so we could procure this super fun toy for our playroom. This runs between $180-275 depending on where you look and the shipping costs. It comes in a solid green color and a clear blue. The “parent” gift is actually one of our favorite toys- the Bilibo. We stumbled upon the Bilibo several years ago and my kids were instantly in love! It is a terrific toy for pretend and active play. My kids use it as a seat that they twirl around in it, balance on it like a mountain, crawl around like it’s a turtle shell, use it as a baby bed, make soup in it- the possibilities are endless! And it’s a steal at around $25. Balance bikes are the coolest thing to happen to learning to ride a bike since training wheels. Some say that their children have learned to ride a bike (without training wheels) in 5 minutes. It has taken my children a bit longer than that but after weekend rides for one summer our 4 year old is ready for pedals. The “grandparent” balance bike is incredibly cool for $100 (w/ free shipping). The KaZAM Balance Bike has a feature that other balance bikes don’t have: a footrest to take the art of balancing one step further. The “parent” version is the WeeRide. 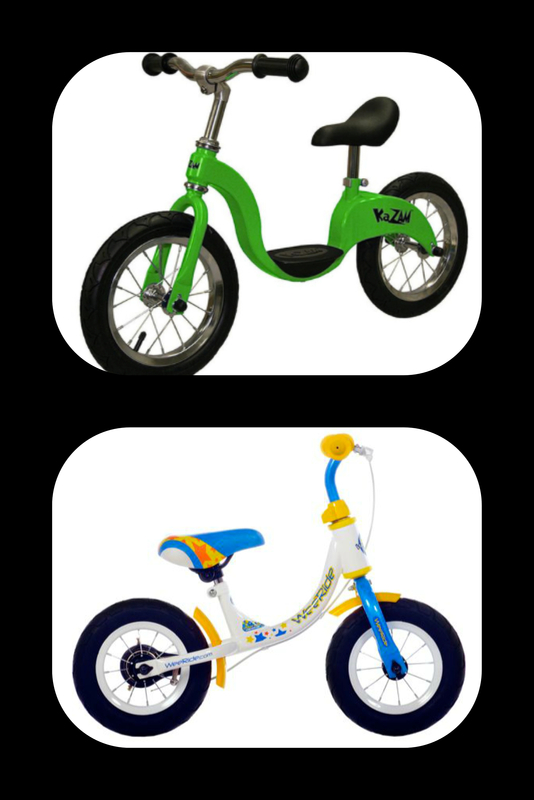 This balance bike comes in two sizes- a WeeRide 10″ for $38 or a WeeRide 12″ for $60. We have the 10″ version for our 3 year old and it has held up amazingly well. How about a side of aspartame with that sushi? 1. I would be bringing my own ginger from here on out. 2. I would make it my life’s mission to find the most amazing ginger out there. 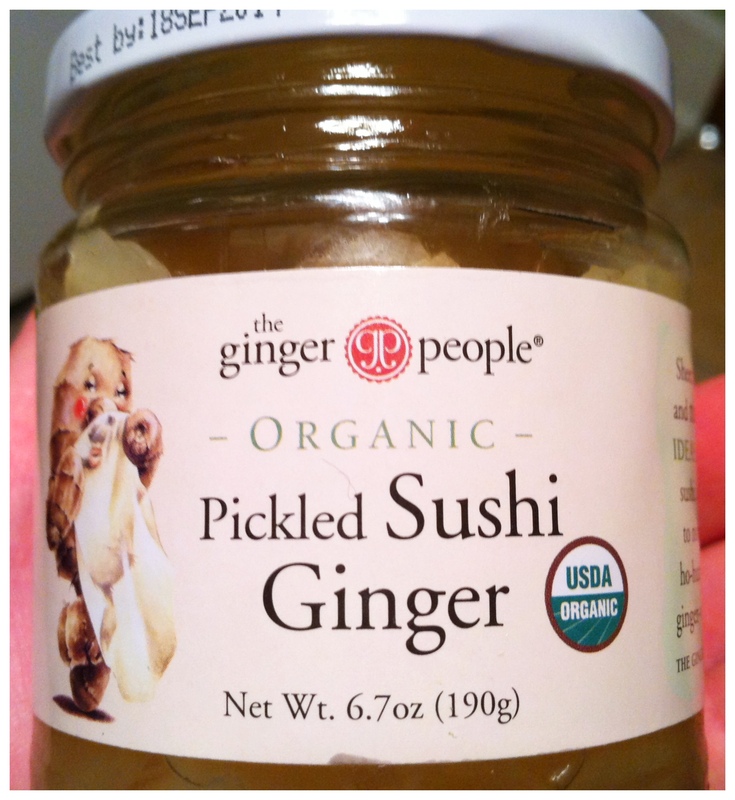 The Ginger People have outdone themselves. This sushi ginger is heavenly & organic! As for me, I can say that I successfully solved another first world problem. I recently took a very unwise peak into the world of “high end” babywearing (yes, such a thing exists & it would blow your mind!!). After drooling over carriers made of fabrics I had never even heard of (& priced so high I could not even convince myself to try to convince my husband), my beloved organic brown Ergo no longer made me happy. After a few days spent dreaming about owning an Obimama WWMT with ears I found my solution: recreate the carrier I already know & love! Obviously dyeing anything that is dark brown is impossible. 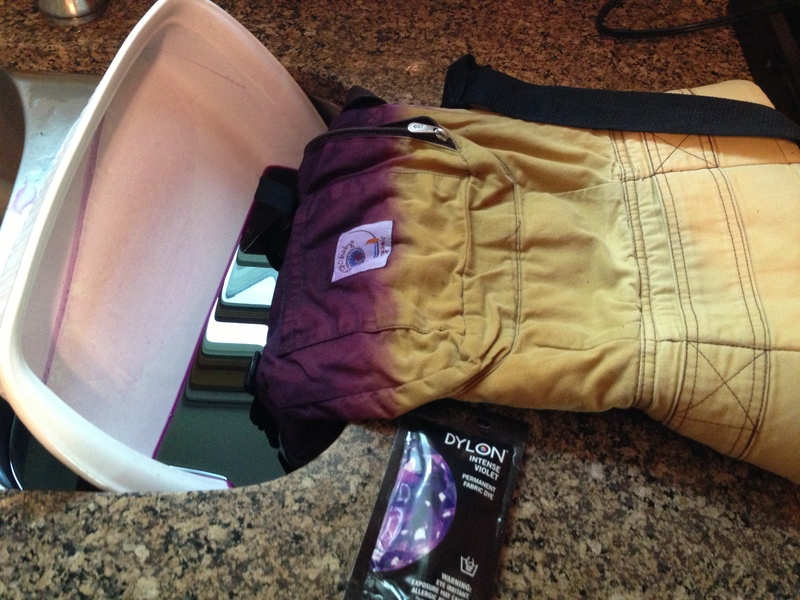 So, step 1: remove the dye. 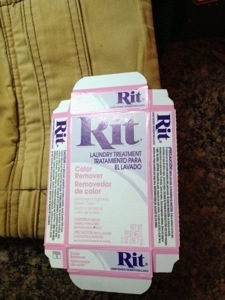 I used Rit Color Remover. I filled my washing machine half way & added 4 packets of color remover. The straps like to float so I used a ceramic casserole dish to weight them down. Within 45 minutes my Ergo looked like this. 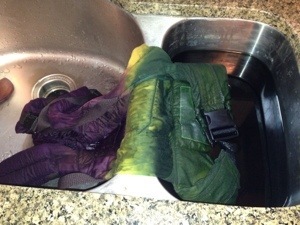 Luckily, I did not pick my colors until after I removed the dye. Considering how butterscotch my Ergo was now, I needed a vibrant shade of green to get the darker green that I envisioned. 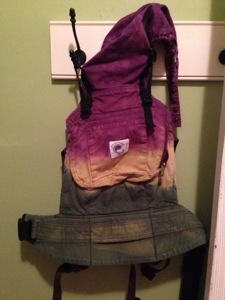 I chose Dylon fabric dye (you can find it at JoAnn Fabrics) because I have had great success with it in the past. I am loving all the ombré that is en vogue right now and used that as my inspiration. I used 2 packets of Intense Violet and 2 of Amazon Green. I let the Ergo sit for 2 hours per color and mixed it around every 15 minutes. The end result: my love affair with Ergo will continue! It turned out awesome! I love the tricolor look & the mottling (I debated re-dyeing to get a more uniform color but the mottling makes it much more visually interesting). I get comments every where I go now- my favorites are from people who never even knew babywearing existed & now are excited to try it.